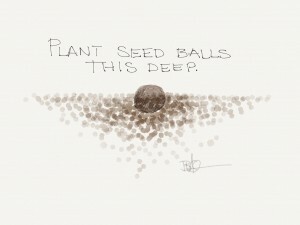 How to plant a seed ball. Annual seeds are usually best sown in the spring, after the danger of frost. Some that are native to climates with freezing temperatures do fine if sown in the fall. Make certain to set the seed ball in an appropriate place for the plant’s ultimate soil, moisture, and light requirements. Press gently into the soil so that the top of the seed ball remains visible.